The team of Frank Beard and Larry Ziegler opened with an 8-under-par 64 on Monday to grab the first-round lead in the Demaret Division competition at the Liberty Mutual Insurance Legends of Golf at the Westin Savannah Harbor Resort & Spa. The duo leads the team of Lee Trevino and Mike Hill by one stroke. 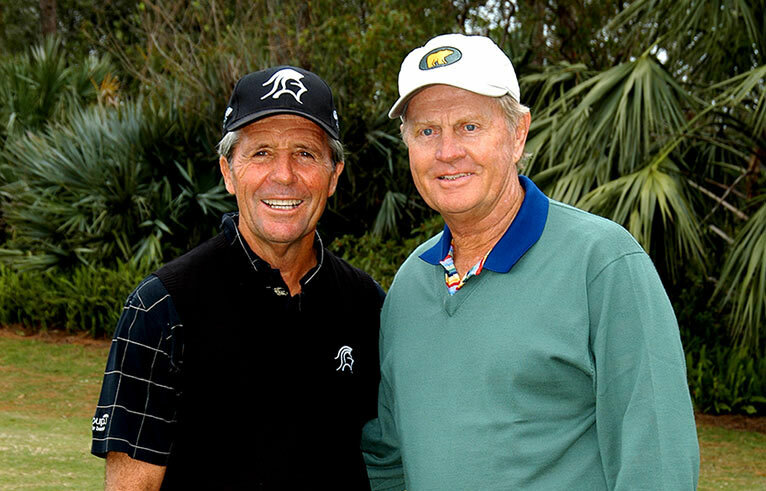 World Golf Hall of Famers Jack Nicklaus and Gary Player, competing together for the first time in the Demaret Division, posted a 3-under-par 69 to trail the leaders by five strokes. The long-time friends sat 2 over after eight holes, but Nicklaus’ birdie at No. 9 ignited a rally that resulted in a 5-under flurry for the final 10 holes. They were paired with Trevino and Hill, both of whom were appreciative of the legends’ presence at the event. Beard and Ziegler are looking to rebound from a disappointing loss a year ago in the Demaret Division when they lost in a one-hole playoff to J.C. Snead and Gibby Gilbert when Snead sank a one-foot birdie putt on the first extra hole. After turning at 3-under, Ziegler and Beard closed strong, making five birdies over the final nine holes to take the lead from Hill and Trevino who are bidding for their sixth win overall in this event. Competition in the 36-hole event will resume at 8 a.m. on Tuesday with the winning team earning $60,000 each.